However, you can’t place a picture outside of the document margins or below the end-of-document marker. If any other text wrapping setting is in effect, you can drag a picture anywhere on the page. You can also move a picture by specifying an exact position for it. 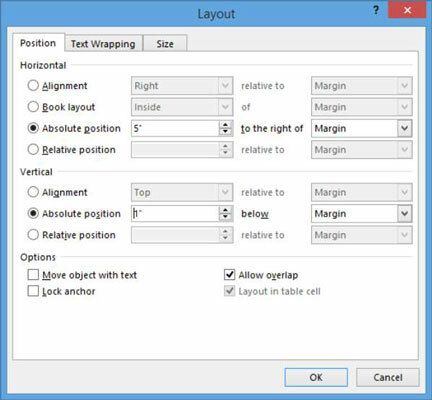 To do so, use the Layout dialog box or one of the presets in the Position drop-down list on the Format tab under Picture Tools. In your Word 2013 document, select the picture you would like to move. Choose Picture Tools Format→Position button to open a menu of positions. Choose the position that shows the picture in the upper-right corner of the document. Drag the picture downward so that its top aligns with the top of the first body paragraph. Click the Position button again and choose More Layout Options. The Layout dialog box opens with the Position tab displayed. In the Horizontal section, click Absolute position, and then in the Absolute position text box, enter 5. In the Vertical section, in the Absolute position text box, enter 1. Here is the dialog box with these settings. Inches are the default units of measurement in this dialog box. The picture’s position is adjusted according to the settings you entered. 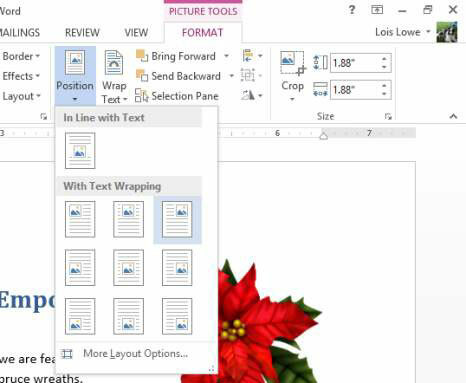 But what if you add or delete text in the document so the text that’s next to the picture now might not later be? What if you want the picture to move with the text? The following steps show how to set that up. Click the Position button and choose More Layout Options to reopen the Layout dialog box. In the Vertical section, for the Absolute Position setting, change the value to 0” and change the Below setting to Paragraph. Make sure that the Move Object with Text check box is selected. Click at the beginning of the paragraph that contains the document subheading (“Come see . . .”) and press Enter twice. Notice that the picture moves with the paragraph to which it is adjacent. Press Backspace twice to delete the extra paragraphs just created.